Hi, my name is Eun Lee and I teach Clarinet Lessons in NYC at Sage Music. Because you are reading this blog, I know that you care about improving your clarinet playing so I’d like to thank you for making the first step toward becoming a better musician and a better clarinet player. These articles will share insider tips with you that all the great professionals and many other students just like you use which will make your clarinet playing feel easier and sound more beautiful right away. In this series I am going to show you how to assemble your clarinet, make your first sound, place your hands properly, tongue and articulate on the clarinet, avoid squeaks, and how break in your reeds. 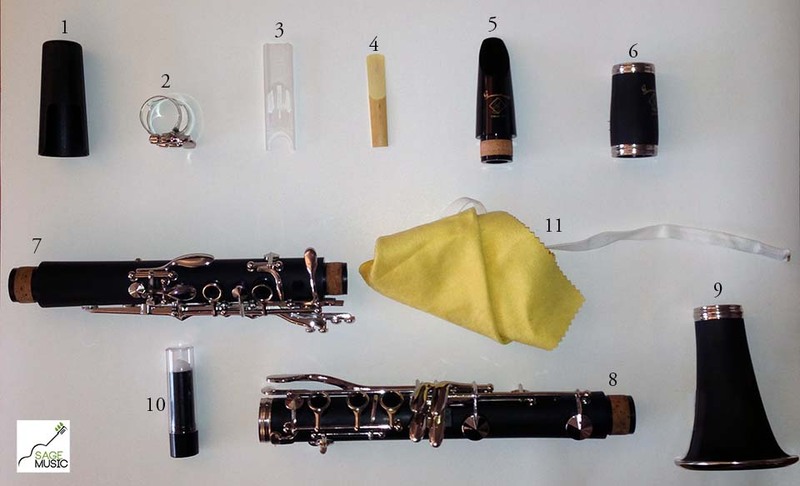 The parts of the clarinet are 1) The mouthpiece cover; 2) the ligature; 3) the reed cover; 4) the reed; 5) the mouthpiece; 6) the barrel; 7) the upper joint; 8) the lower joint; 9) the bell; 10) cork grease; 11) the swab. I’ll present these as a series of simple steps so that you can easily follow along. Gently twist the bell onto the lower joint. Always make sure to gently twist each piece into place, don’t just push them together. If it feels too resistant, just apply a little lubricant, like cork grease, on the tenons of the instrument. This allows for easier assembly, and will preserve the joints of your clarinet. Twist the upper joint onto the lower joint. When twisting the upper and lower joint together, be sure that the keys of the two joints don’t bump into each other, this can damage them. Align the bridge mechanism. You need the bridge mechanism to align between the two joints so that your clarinet will function properly. Align the mouthpiece. Twist the mouthpiece until the hole in the mouthpiece is aligned with the back key on the upper joint. Moisten the reed. Your reed should be moistened with water, or your own saliva. Put on the reed. Place the reed on the mouthpiece so the flat side of the reed is against the mouthpiece opening. Move the reed up or down the mouthpiece until you see just the slightest bit of mouthpiece behind the reed. Ensure that the reed is vertical and aligned with the mouthpiece. Secure the reed with the ligature.Slip the ligature over the mouthpiece and reed. Make sure that the ligature is low enough that it is covering the bark of the reed and not the vamp, which is the carved part of the reed. Tighten the ligature to secure the reed’s placement. Your clarinet is now assembled! Special considerations about the reed. The most important part of your clarinet is your reed. When you blow air across the reed, the reed vibrated to create your clarinet’s beautiful signature sound. Thus, great care must be taken to ensure that the reed is properly moistened, and is protected to prevent cracking, chipping, or any other damage. During assembly you worked from the bottom to the top of the clarinet. In disassembly you’ll do the opposite, working from top to bottom. Remove the reed. Carefully take off your reed and place it back into its plastic sleeve or reed case. Remove the mouthpiece. Separate the mouthpiece from the barrel using a twisting motion. Store your mouthpiece. Place the ligature back on the mouthpiece, slip the mouthpiece cap on the mouthpiece, and then place them back inside the case. Clean the clarinet. At this point, especially if you just had a long practice session, you should clean your clarinet. Grab your swab, and feed the end with the string and weight into the clarinet’s bell; flip it over to pull the string out. Do this as many times as is necessary to dry the clarinet. Remove the barrel. Twist off the barrel from the upper joint and place it in your case. Remove the upper joint. Twist off the upper joint. Again, be mindful so that you don’t damage the keys and connecting parts. Place the upper joint in your case. Separate the bell and lower joint. Twist apart the bell and lower joint and place them in your case. Congratulations, you just learned how to assemble, clean, and disassemble your instrument. Great work! Now you know how to put it together, learn how to make a beautiful sound on the clarinet. Stay tuned for more blog entries from me. In the meantime, please let me know if you’ve had any success with trying out these clarinet tips from me. Post responses here on the blog or via Sage Music social media, links below. Just purchased a clarinet. Never played one in my life. So a complete virgin. Introductory video was great, need more on the techniques involved in getting a good sound, followed by some tutorial exercises. Also , how your hands/fingers should be placed on rage instrument. Not much to ask is it? I guess I will need to find a tutor and go back to school. Thanks So much for this information. Please how can I teach myself on how to play this instrument. Can you send me any handbook or manuals. I play on keyboard and guitar very well but I still long to know one wind instrument. I would like to see videos on playing clarinet for beginners. Thanks for the feedback, Romaul. We will have some new videos coming out soon! Thank you so much! We had no idea how to put together my son's clarinet. I played violin and was of no help! I will be having him watch all of your other introductory videos. Thanks, Alisha. Let us know what other videos will be helpful, and we'll try to get them onto our production schedule. I feel like if I owned a clarinet that I would loose one of those pieces. It's probably why my mom started me out with voice lessons. My youngest sister has taken an interest in wanting to play the clarinet and I'm sure she'd appreciate this.